Our Stonehaven Florists are highly experienced in the field of floristry as they have over forty years of experience so we are positive that whatever it is you're looking for, our Stonehaven Florists will be able to create the perfect bouquet for you. We use only the best possible quality flowers which have been directly imported to us all the way from our cultivators in Holland and with up to four deliveries per week from our suppliers, our flowers are also the freshest with a high longevity. 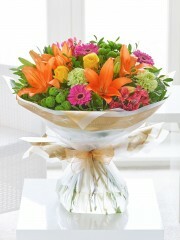 A high longevity means that your recipient will be able to enjoy their flowers for many days to come. Our Stonehaven Florists expertly craft a range of stunning flowers - from anthuriums to lilies and delphiniums and so on - which are arranged beautifully in a bed of lush greenery including eucalyptus leaves amongst others. 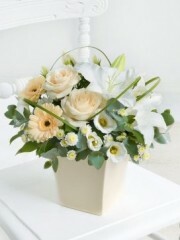 Once the actual bouquet has been arranged, our Stonehaven Florists finish off all arrangements with fittingly lovely papers, tissues and ribbons or alternatively, our Stonehaven Florists can arrange your flowers in a beautiful vase or a charming box depending on what it is you're looking for. Up on our Stonehaven Flowers, you can have a flick through the arrangements our Stonehaven Florists have already arranged however if nothing catches your eye, don't fret as we offer our customer the bespoke service. Through the bespoke service you can either tweak aspects of an arrangement from our website or you can work in collaboration with our Stonehaven Florists and design a completely unique bouquet which our Stonehaven Florists would be delighted to make for you. Our bespoke service allows our customers to let their creativity run wild while at the same time our Stonehaven Florists will arrange a bouquet that your recipient is sure to love as it will be composed of their favourite flowers. Our Stonehaven Florists want nothing more than to provide our customers with stunning bouquets for you to give to your loved ones. Our customers have the opportunity to use one of our multiple delivery services to have your beautiful bouquet delivered to either your recipient or yourself if you wish to give the bouquet to your loved on in person. We offer our customers our standard weekly delivery Monday to Saturday, our next day delivery service as well as our same day delivery service. The same day delivery service allows our customers to place an order and have it delivered on the same day. This means our Stonehaven Florists arrange your bouquet on the day of delivery which is why, in order to use the same day delivery service, your order must be placed before 3PM to give our Stonehaven Florists enough time to organise everything for you. Although we aren't able to guarantee specific times of delivery, we do have our AM and PM deliveries. This means we can guarantee a delivery at some point before 1:30PM and then after 1:30PM, within those time frames we aren't able to guarantee any other times. Additionally, not only do we have multiple delivery services but we also deliver globally as we are part of the Interflora delivery network. Through Interflora we are able to deliver locally, nationwide all over the UK as well as abroad to over 140 different countries so distance is not an obstacle for us. 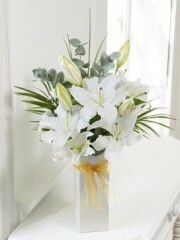 Your flowers will be delivered in pristine condition to your desired location at the hands of efficient delivery drivers. Once your order has been placed, our Stonehaven Florists will take full charge and take care of everything on your behalf.